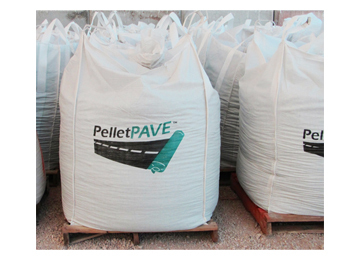 PelletPAVE - AR is our flagship product. It is used as an alternative to the difficult field blending process when the project specification calls for a high rubber content, high viscosity Asphalt Rubber binder. 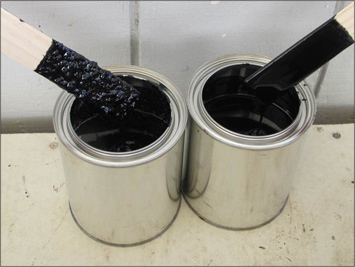 Typically used in gap or open graded mixes at an application rate of 20% - 40% (by weight of total binder) to meet an Asphalt Rubber binder requirement for Viscosity, Penetration, Softening Point and Resilience. PelletPAVE can be produced with any size/gradation of crumb rubber to meet local agency requirements. The PelletPAVE | AR formula starts with "wet process" blended and reacted ASTM D6114 defined rubber binder with a minimum of 20% crumb rubber. This convenient pelletized binder material eliminates the expensive equipment that was once needed for blending asphalt rubber binder at the hot mix plant site. In the past, a hot plant owner that did not have a rubber blending unit would need to contract that service out. Typically this requires a rather costly mobilization fee in addition to the blending costs. In some cases it would also require additional environmental permits to have additional CO2 and NOX generating equipment on site. The pelletized asphalt rubber binder is an energy saver too. It is stored at ambient temperature at the hot plant site until needed. At the time of use, the proportional amount of the PelletPAVE | AR is mixed, either through a RAP collar of a continuous drum plant or directly into the mixer of a batch plant where it melts and is blended with the heated aggregate to produce asphalt rubber modified hot mix. 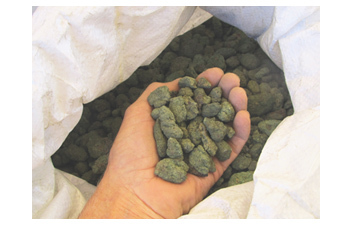 With a field blending operation the binder producer must work under the time restraints and schedule pressures at the hot plant imposed by the project. This can sometimes lead to shortcuts that can negatively impact product quality. The PelletPAVE pelletization process is done in a dedicated manufacturing plant without time or project pressure issues. This lets us produce a precise, pre-manufactured product with dependable consistency.